30 Second Wine Advisor: Good affordable Burgundy. Oxymoron? Not. Give a Gift They'll Love. Save $48.95. Look Brilliant. Send your gift recipients on an armchair tour of California's best "mom & pop" wineries with The California Wine Club and save! Good affordable Burgundy. Oxymoron? Not. A lot of wallet-conscious wine lovers have pretty much written off Burgundy in recent years. All but the most ardent Burg-heads fret about Burgundy's reputation as a wine region that's hard to get to know, broken into tiny parcels of wildly variable terroir and beset by troublesome vintages. And perhaps most important, Burgundy is seen as subject to wild and incomprehensible vintage variation. Best to avoid? It almost sounds so. And yet, if you've ever had the pleasure of tasting a great mature Burgundy, you know you won't die happy until you've had another. While you're waiting for that transcendent "bucket list" experience, let's face it: Even a Burgundy from the lower end of the budget line, chosen with some care, reflects back a bit of the brilliance of the world's best source for Pinot Noir. Don't expect to hear choirs of angels sing, but surely you can summon a string quartet, or maybe even a cool jazz trio, with a generic Bourgogne Pinot Noir from a decent proprietor. Louis Jadot makes a reliably good version. 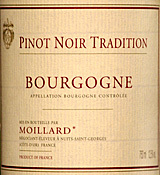 This week, I spotted a smaller-production item, Moillard 2007 Pinot Noir "Tradition" Bourgogne. It was grown in the 2007 vintage, a rainy season that dried up just in time for harvest, resulting in variable results depending on how each grower dealt with the hand that nature dealt. In this niche, though, the Moillard proved fully competitive at a couple of bucks under $20. Full of subtle red-berry fruit, it showed mouth-watering acidity and soft tannins that set up your palate for whatever's on your plate. It's subtle, not in-your-face, but there's plenty of flavor and Pinot texture here. Let's put it this way: If wine were art, this one would be a numbered print of a watercolor or pen-and-ink drawing. Not a budget-breaker, not a wall-size landscape in oils, but a very attractive work nonetheless, and a decent value that would look great in your dining room. Give a three-month wine adventure for the price of a two-month adventure: just $97.90! With The California Wine Club, you can send your gift recipients on an armchair tour of California's best "mom & pop" wineries. It's a unique gift that can't be found in stores. Each gift month is just $48.95 (includes shipping & handling), and includes two bottles of award-winning, limited production wine and an in-depth look inside the featured winery with Uncorked Magazine. Every wine is 100 percent guaranteed to be one they'll love. Send as many months as you wish. When you send a two-month gift or more, we'll include an extra month on us! Call 1-800-777-4443 or visit www.cawineclub.com and use promo code: ADVISOR when ordering. P.S. : This would make a fantastic holiday gift - Just request a December shipping date! FOOD MATCH: One of the many joys of Burgundy, even a modest generic Bourgogne, is that it goes well with a broad range of fare: Red meat of course, but also poultry or pork, mushrooms, cheeses, even vegetarian fare. It was fine with a meatless Southwest Asian eggplant dish, Imam Bayildi, made with lots of garlic and juicy late-season garden tomatoes. VALUE: As noted above, Burgundy isn't cheap. A good Bourgogne Pinot Noir well under $20 is a strong contender in its price neighborhood, though, and both the Moillard and recent vintages of Louis Jadot comfortably make it under that line..
Wine-Searcher.com comes up with relatively few sources for Moillard "Tradition." For another source, try this link to the same wine at K&L Wines in the San Francisco Bay area. If you can't locate Moillard but still ache for a good, affordable Bourgogne, try this link for the always reliable Louis Jadot Bourgogne Pinot Noir.